Almost 200,000 motorcycles are registered in Georgia, and the state remains a popular destination for out-of-state riders because of its warm weather and moderate year-round temperatures. But riding a motorcycle carries the risk of suffering a serious injury if you are involved in a crash. In fact, according to statistics kept by the National Highway Traffic and Safety Administration, motorcycle deaths are 27 times more likely than deaths from other vehicles. 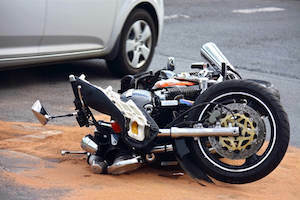 Motorcycle accidents typically occur when a motorcycle collides with another motor vehicle. Many of these accidents happen when a motorist fails to yield the right of way to the motorcycle rider. Often, motorists insist that they did not see the motorcycle, though many probably failed to look. This is particularly true when motorcycles collide with trucks due to the truck’s vision restrictions and blind spots. Motorcyclists need to practice safe defensive driving, but even the best driving can’t prevent collisions when other drivers are negligent. Broken bones. When motorcyclists contact another vehicle or the road, broken bones result. Many breaks occur to the forearms and the knee or lower leg. Head injuries. Head injuries can be among the most catastrophic. Because our brains control motor skill, language, and emotions, victims can suffer a decline in any of the areas depending on where the injury occurs. The likelihood of head injuries increases if you weren’t wearing a helmet. Spinal cord injuries. When vertebrae shatter or break, your spinal cord can become damaged. As a result, you might lose sensation or movement in your legs or in all four limbs. Facial injuries. Victims can suffer burns to the skin or breaks to facial bones. They may also suffer an eye injury, resulting in blindness. Road rash. This term refers to the cuts and nicks that a motorcyclist suffers during an accident as they slide away from the crash over the road. Depending on the severity of your injury and other circumstances, you might receive compensation to cover the costs of medical care, pain management, rehabilitation, and lost wages. Georgia motorcycle accident victims might also receive money to compensate them for their pain and suffering. If the driver who caused the accident was under the effects of drugs or alcohol, then you might be able to receive punitive damages as well, which are meant to punish the defendant for their reckless conduct. Accident victims deserve fair compensation to make up for the unjust losses they suffer in motorcycle accidents. At Slappey & Sadd, we are committed to obtaining a fair result for our clients by holding the party at fault legally responsible for your injuries. Call us today at 404-255-6677 or fill out our online contact form. We serve the entire state of Georgia, including Marietta, Covington, and Norcross.